Kalindi, Empress Mallikata (4678 - present) is the imperial ruler of the Kaliyatra empire. She was the third wife of the Kaliyatra Emperor Bhimaksa. Lady Kalindi was made empress in 4695 after Empress Anarikha was forced to commit suicide. When the emperor died in 4696, his son Balakha ascended the throne at the age of four and was adopted by Mallikata as her son. 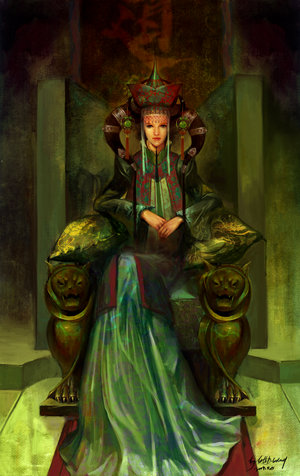 She remains as queen regent with the title the Holy Mother Empress. It is not known how she became a servant at the imperial household, but she became a concubine of Bhimaksa when he was the crown prince. Bhimaksa was greatly impressed with her talent and beauty. While not wife or princess at the time, Kalindi was a favoured consort of Bhimaksa. They did not have any children. The emperor neglected his wife to such a degree that the empress conspired against her husband. She is described by Balavala as "ruthlessly ambitious, cruel, and superstitious". She is beautiful and feared in battle, skilled in both archery and swordsmanship. In fact, her officials fear her so much that they refrain from trying to correct her with advice because of her cruelty.